In a recent issue of the New Yorker, artist Julian Schnable answered the question, “What is the worst thing you can do as an artist?” with the response, “Try to get people to like you.” I agree. Yet, nevertheless (for better or for worse), it is quite thrilling when they do. 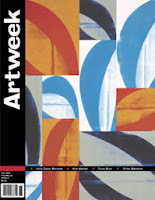 So I was delighted to read the positive review of my show at the Bolinas Museum in the June issue of Artweek. Thank you to contributing editor Frank Cebulski for articulating such a full picture of my art practice and honoring its surrealist roots. For anyone who would like a pdf copy of the article emailed to you, please send me a note. Or you can pick up a copy of the magazine at these locations. Congratulations on the review. I would love to read it, as I so enjoyed seeing the show!